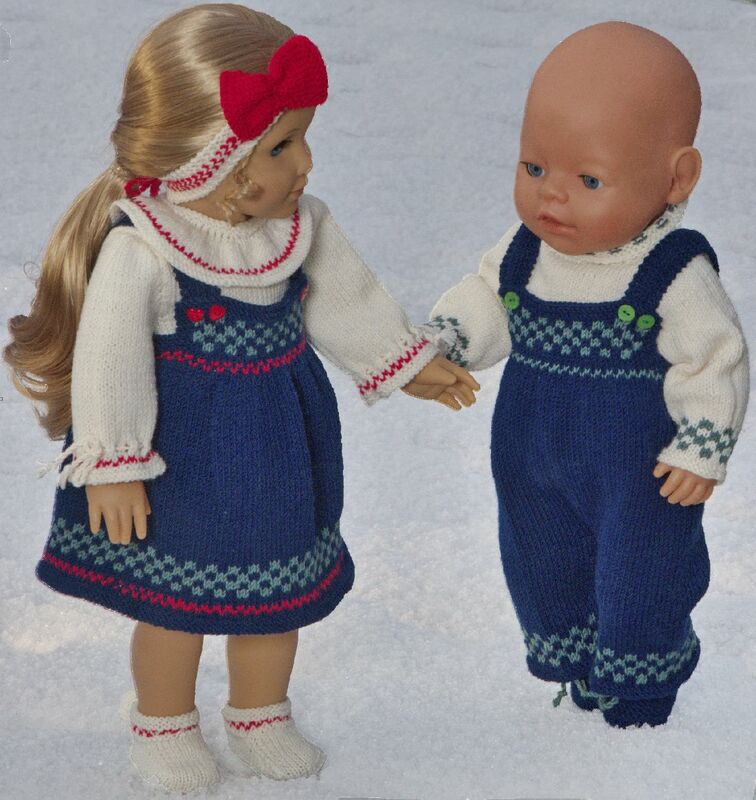 Then both your dolls should be beautifully dressed for Christmas celebration! 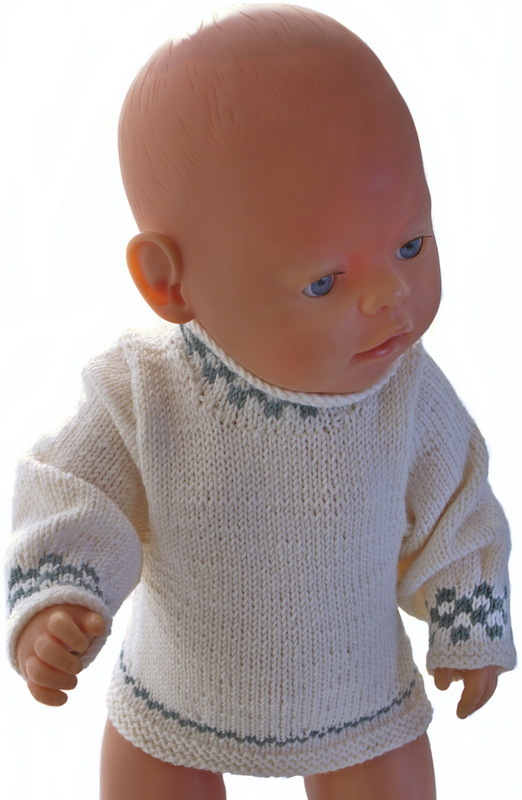 With Christmas approaching, I’m sure your doll will appreciate some new clothes for the festive season. 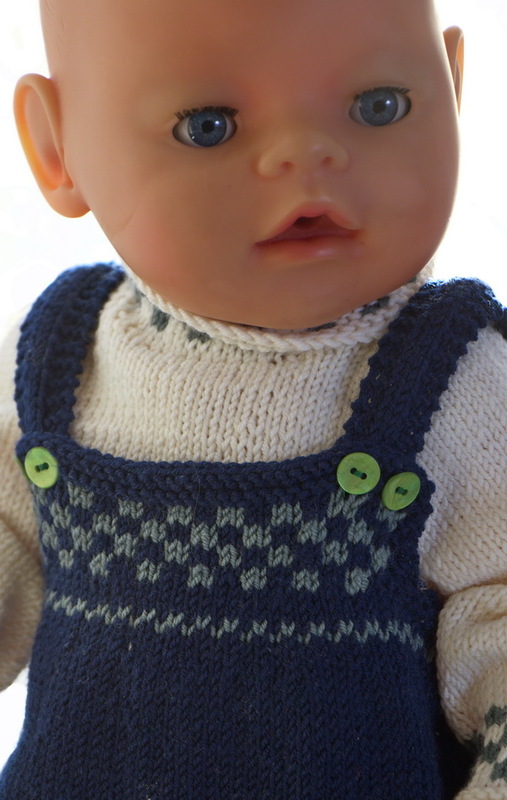 This year I have knitted an outfit for a girl doll and another one for a boy doll. 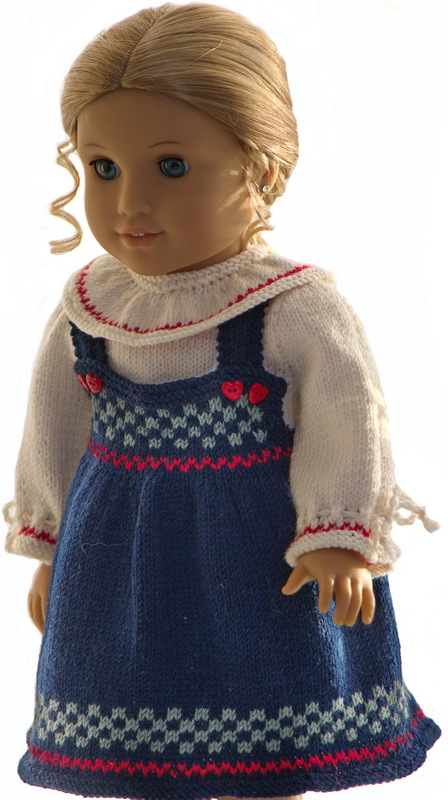 I started knitting a skirt for the girl doll in dark blue. The skirt has a pattern round the edge. The yokes front and back has the same square pattern in green inside edge sts. 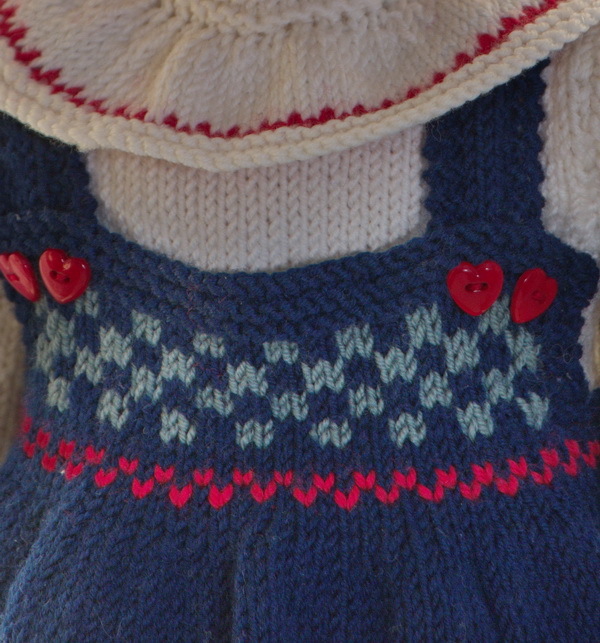 The skirt has suspenders and are buttoned front with small red heart buttons. To match this skirt I knitted a blouse in white. 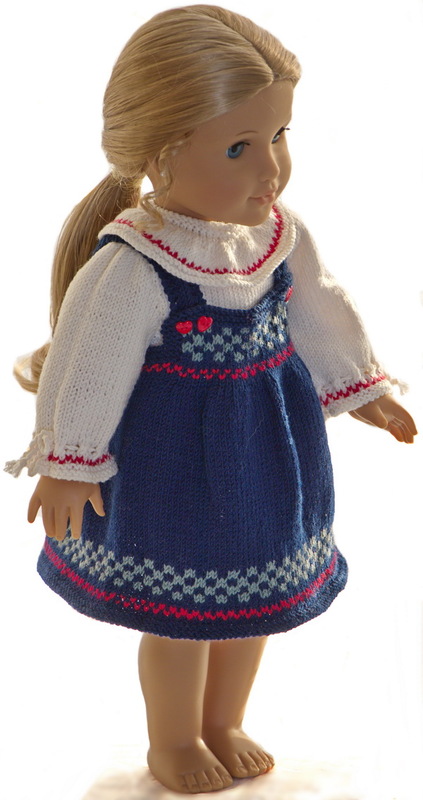 The blouse has a little red pattern round the body and round the sleeves. The blouse has a wide white collar. 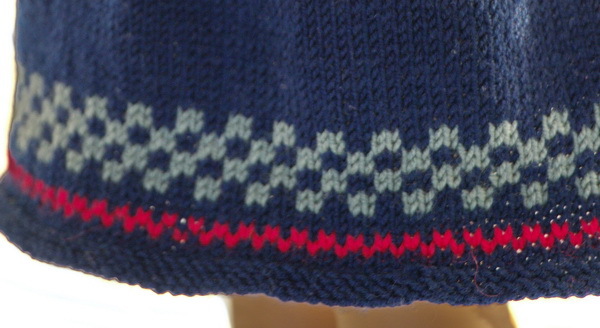 The collar has this little red pattern along the edge. It is buttoned back and matches the skirt perfectly. White chords are pulled through the eyelets and bound in small bows. 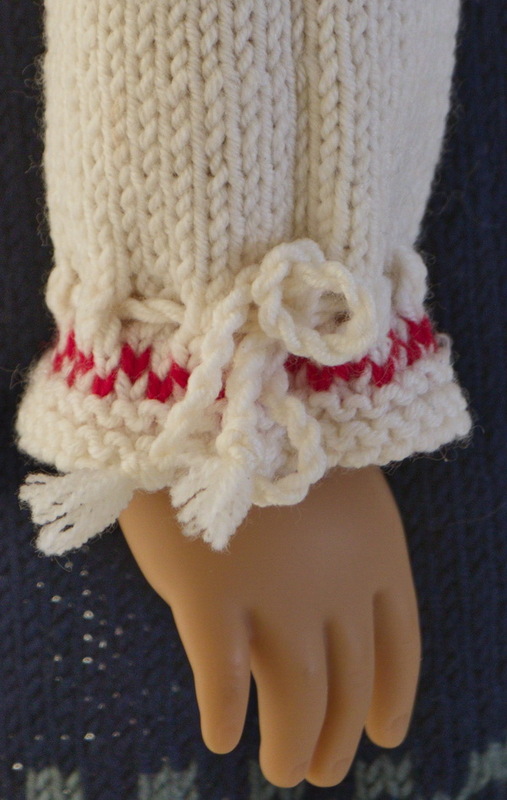 The pants are knitted in white with the red pattern around the legs. It is held up with a chord bound around the waist in a bow. Then I knitted a hairband. 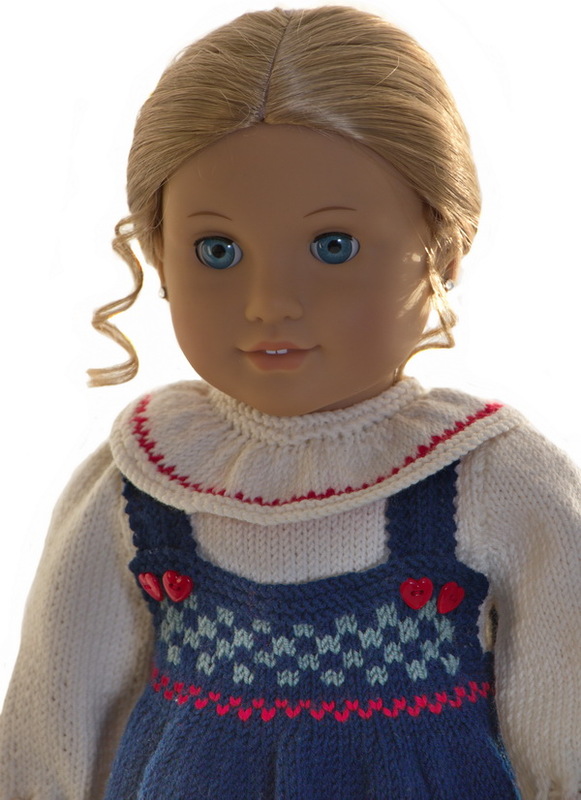 The hairband has a pattern in red along the center and a bow in red sewed to the hairband. I made a chord in red, pulled it through the eyelets at the ends of the hairband, and bound it in a bow. 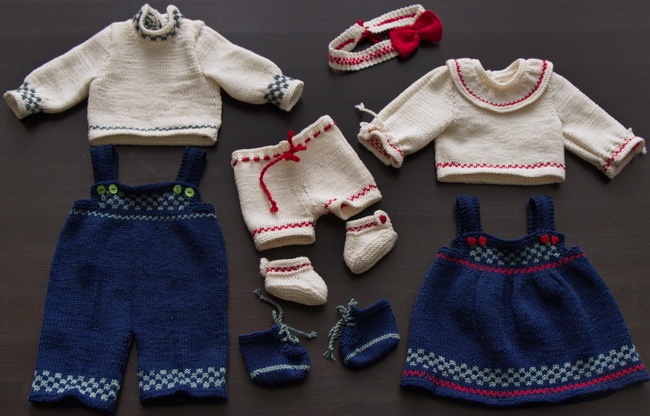 To complete the outfit I knitted a pair of small, white shoes. The shoes have this red pattern and are buttoned around the ankles with small red heart buttons. Lovely outfit for Christmas celebration. 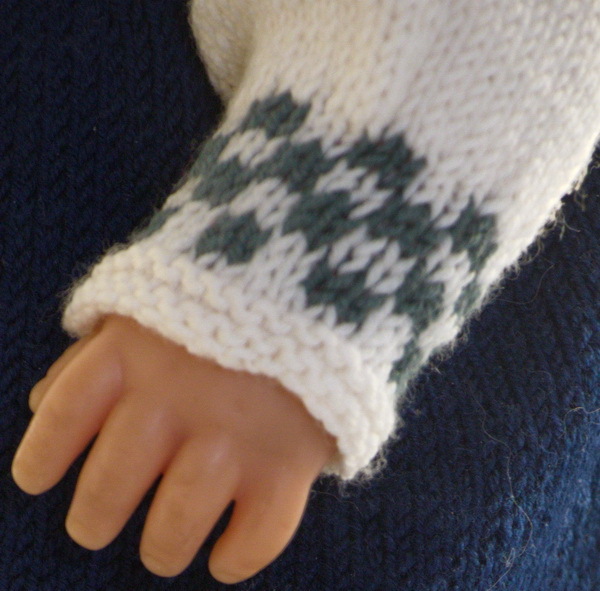 ... but with a square pattern in green round the sleeves. 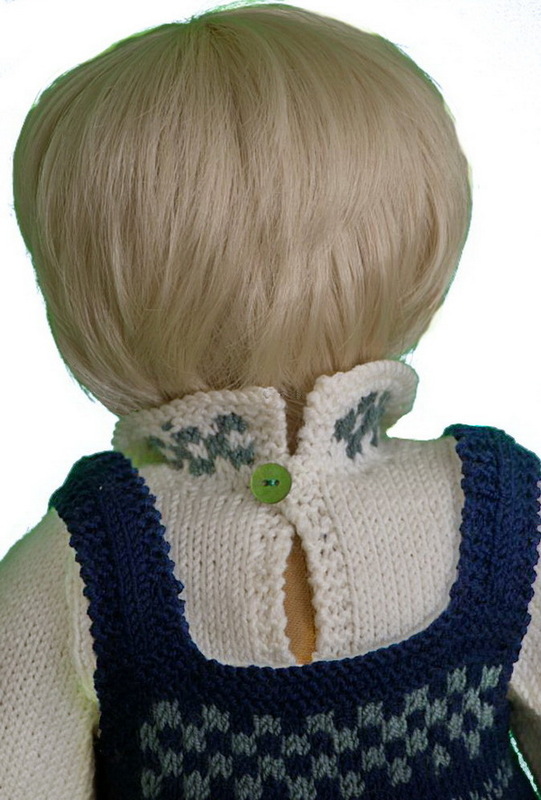 The neckband is knitted having the same square pattern in green inside edge sts knitted in white. It is buttoned back. 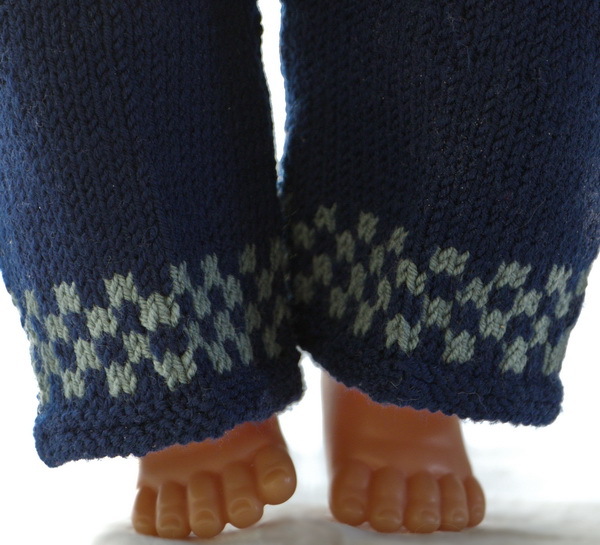 The pants are knitted in dark blue and reach the middle of the legs. If you prefer longer legs, you can knit them longer. ... and around the waist. 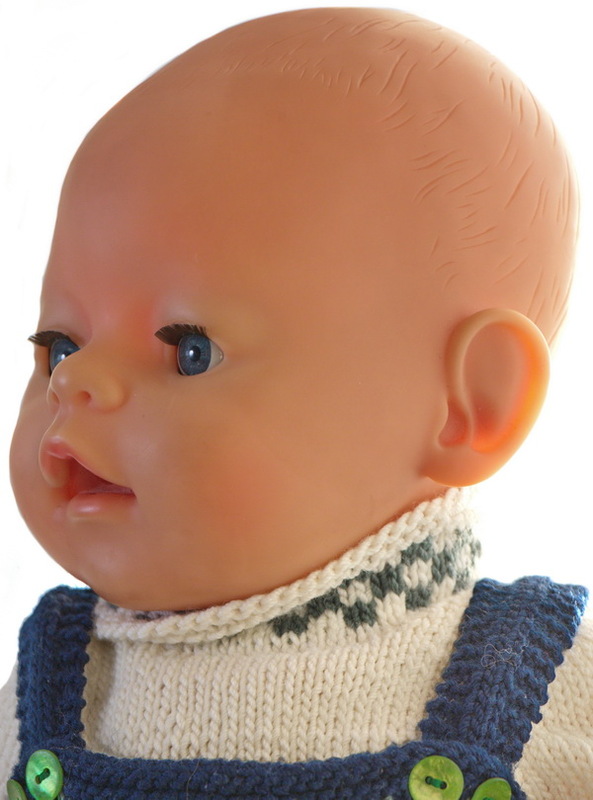 It is held up with suspenders and buttoned front. 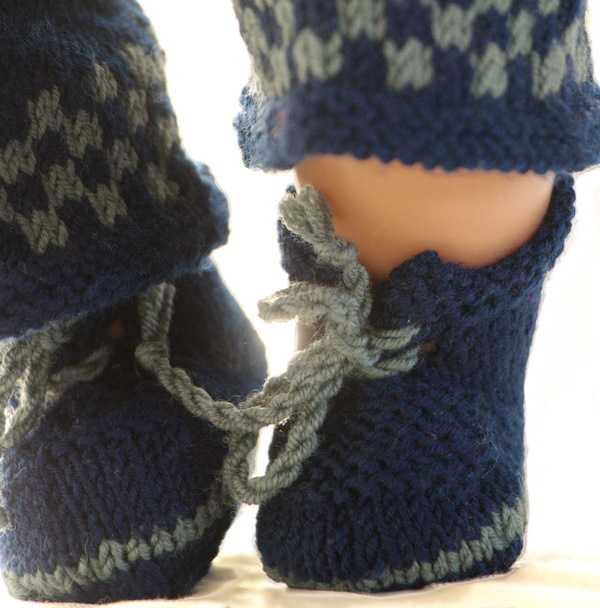 Lastly, I knitted a pair of shoes to make the boy doll’s outfit complete. 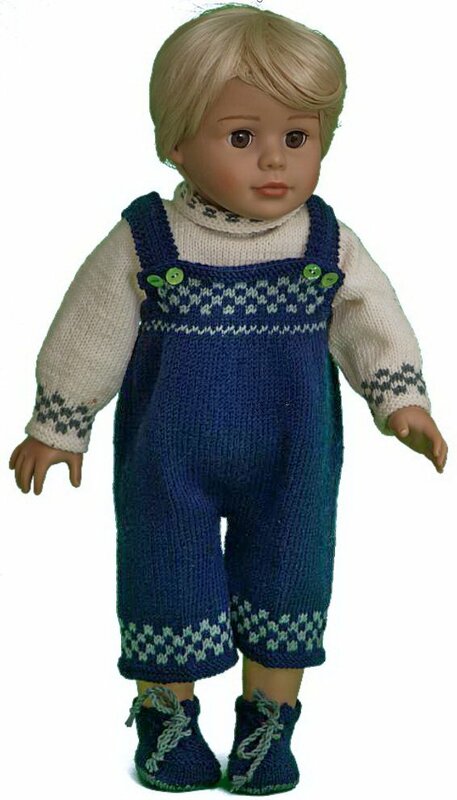 The shoes are knitted in dark blue and have a little stripe in green around the sole. It is bound together front with green chords. 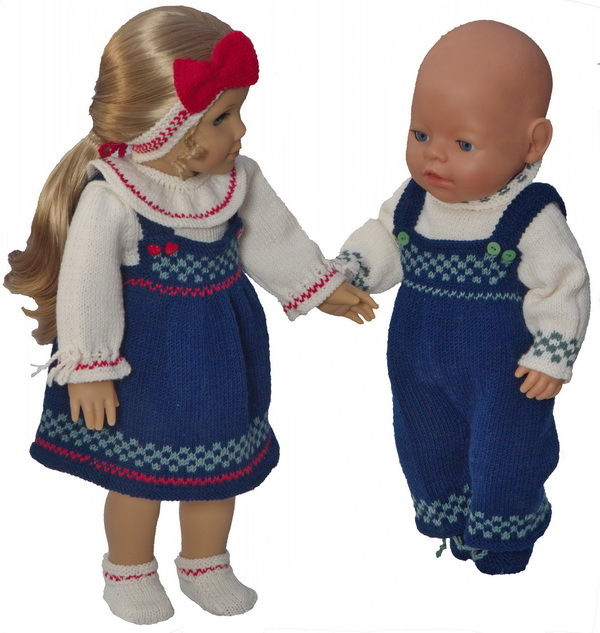 Both your dolls should be beautiful dressed for Christmas!